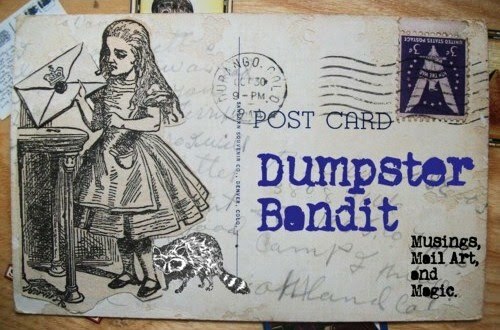 Dumpster Bandit: Some of the loveliest Mail Art Postcards I've ever received. Some of the loveliest Mail Art Postcards I've ever received. This is one of my favorites of all time, because it has a Raccoon and alludes to Dumpster Diving! This beauty was made last September by one of my best friends, Ali. I love Kathleen Hannah and any art that alludes to Feminism- because I think it (Feminism) is hella important and still valid in our society. Silhouetted hillside against a cloudy sky. Vintage Horse and Rider photograph with a goldleafed border.... I love Horses, including that Patti Smith album! Altered photograph of a Gnome. Created by Spinweaver for a "Gnome Postcard" swap via Swap-bot. Very Crafty postcard made from vintage photographs pasted over an old dictionary page. Created by Angela (StiffNeck18) for a "HandMade Postcard Swap" via Swap-bot. Both of these postcards were created through digital collage, and sent via SendSomething. The one of the left was sent from Cuan Miles in S. Africa. The one on the right "A woman in Space" was created by Fast Eyes. That's all for now friends. Perhaps for my next post I'll put up some mail art postcards that I've made, or I might post some photos of fine Mail Art envies that I've sent/received. Stay tuned!